World records were falling at the drop of a hat during the 2nd European Short Course Championships, held at the very fast Ponds Forge pool in Sheffield, England, Dec 11-13. The Swedish team of Daniel Carlsson, Patrik Isaksson, Jonas Akesson and Lars Frolander ties with Germany's Thomas Ruppath, Mark Warnecke, Stephan Kunzelmann and Alexander Luderitz in the 4x50 medley relay. Britain's Mark Foster ended the three days of competition as the richest man with DM 40,000 (US $24,000) for world records in the heats and final of the 50 freestyle. 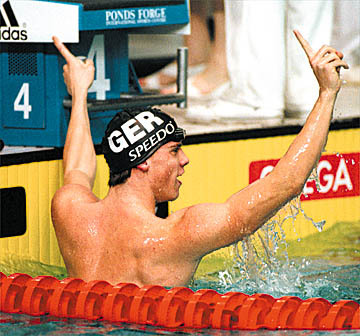 He also dipped under the 50 butterfly world record, only to finish second by 4/100ths of a second to Croatia's Milos Milosevic, whose 23.30 established a new world record. Foster's 23.34 was a British and Commonwealth record. Foster's world records in freestyle came first in the prelims, with a 21.48 that bettered Alexander Popov's world record of 21.50. In the final, he had a perfect swim, hitting the start, turn, and finish just right. Foster shaved another 17/100ths of a second off his time with 21.31. Inge de Bruijn (NED) got the European championships off to a flying start with a European record in the morning prelims for the 50 butterfly with 26.54, lowering it in the finals to 26.09. She added continental records in the prelims of the 100 butterfly and 50 freestyle, but failed to repeat these in the finals. In the 100 fly, Martina Moravcova (SVK) shaved another 21/100ths of a second from de Bruijn's time to win with 57.72. In the 50 freestyle, de Bruijn's winning time was 24.41, slower than her prelim record of 24.38. Moravcova swam to a new world record in the 100 individual medley with 1:00.43 and added another European record in winning the 200 freestyle with 1:55.12, beating Franziska van Almsick (GER). Although Franzi has still to find her winning ways, she certainly looked more like her old self and cannot be written off. She has opted not to compete at the World Short Course Championships in Hong Kong in April, but should be ready for the European Championships next summer. James Hickman (GBR), the world short course champion and world record holder in the 200 butterfly, soon had everyone sitting up when he swam a world record of 51.02 in the prelims of the 100 fly, bettering Michael Klim's (AUS) world record of 51.07 from last January. Hickman surprised himself when swimming against Lars Frolander (SWE) and was so determined not to be beaten that he had to swim this fast to stay ahead. In the final, the race between them was even closer, but Hickman's superior strength off the walls gave him the edge. Frolander's time of 51.25 in the prelims and 51.11 in the finals were national records. Hickman added an easy win in the 200 fly with 1:52.96 on the first day. On the second day he won the 200 I.M. in 1:56.36, beating world long-course champion Marcel Wouda (NED) and short course record-holder Jani Sievinen (FIN). The German trio of Sandra Volker, Mark Warnecke, and Thomas Rupprath were not to be left out. 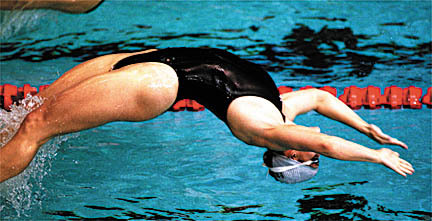 Sandra Volker missed the podium in the 100 freestyle, finishing fourth, and scratched from the 50 freestyle final. 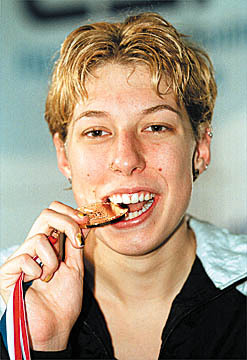 She set a world record in the 50 backstroke with 27.27, and added a win in the 100 backstroke with 59.84. Mark Warnecke lowered his world record in the 50 breaststroke by 27/100ths of a second to 26.70, but missed winning the 100 breast. Patrik Isaksson (SWE) was first with 59.22 to Warnecke's 59.77. Thomas Rupprath set a new European record in the prelims of the 50 backstroke with 24.41 and lowered it in the finals for a new world record of 24.13. While the established stars were breaking records, Flavia Rigamonti (SUI) and Orn Arnarson (ISL) were making history by becoming their respective countries' first-ever European champions. Rigamonti, 17, produced a well-paced victory in the 800 freestyle. She moved smoothly into the lead at 200 metres and moved ahead of early leaders Sarah Collings (GBR) and Carla Geurts (NED), who gradually dropped off the pace. Her winning time of 8:27.85 was just ahead of Geurts in second with 8:28.20. Arnarson, 17, from Iceland, won the 200 backstroke, moved into the lead at 150 metres setting a national record of 1:55.16. He battled Adam Ruckwood (GBR) for the gold for most of the last length. Another teenager to make his mark was 18-year-old Adam Whitehead (GBR), who won the 200 breaststroke with 2:08.54. Earlier this year, he medalled at the European Junior Championships and the Commonwealth Games.